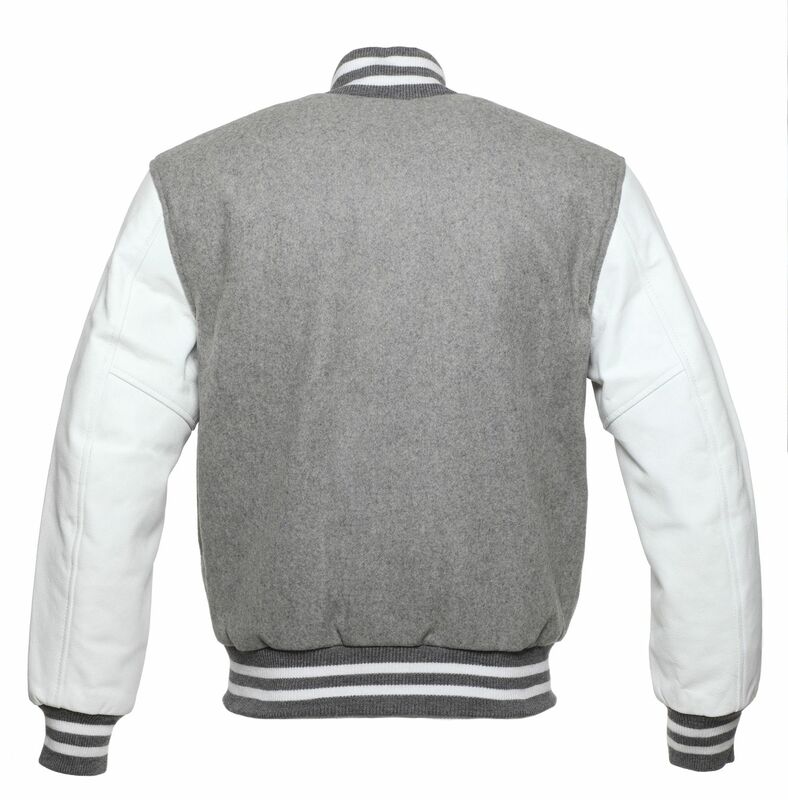 The iconic American grey and white varsity jacket, made of 24 ounce grey wool body with white cowhide leather sleeves. 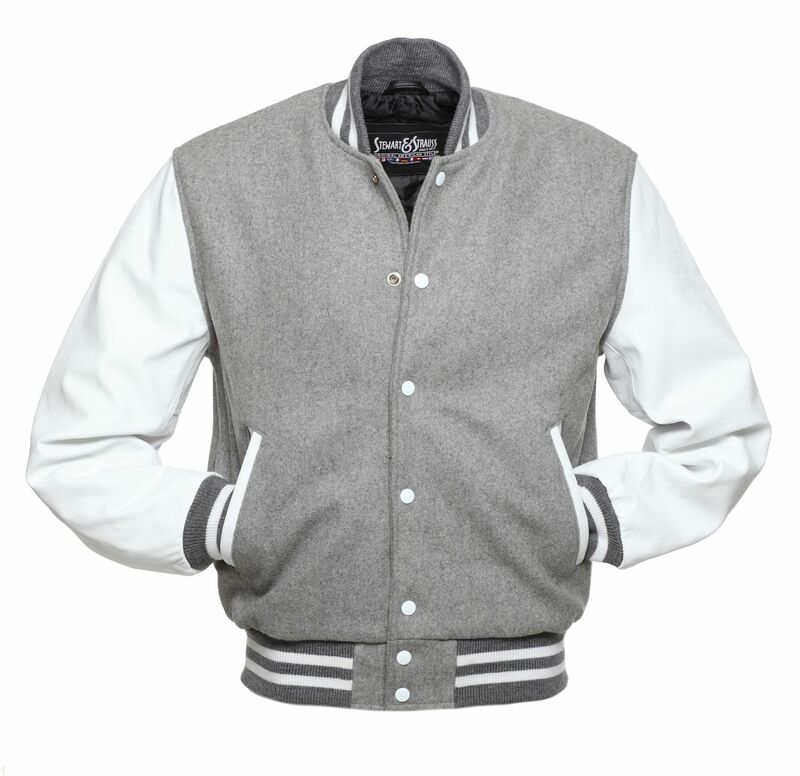 Not only are varsity jackets are worn by school athletes, they have taken over the fashion world! 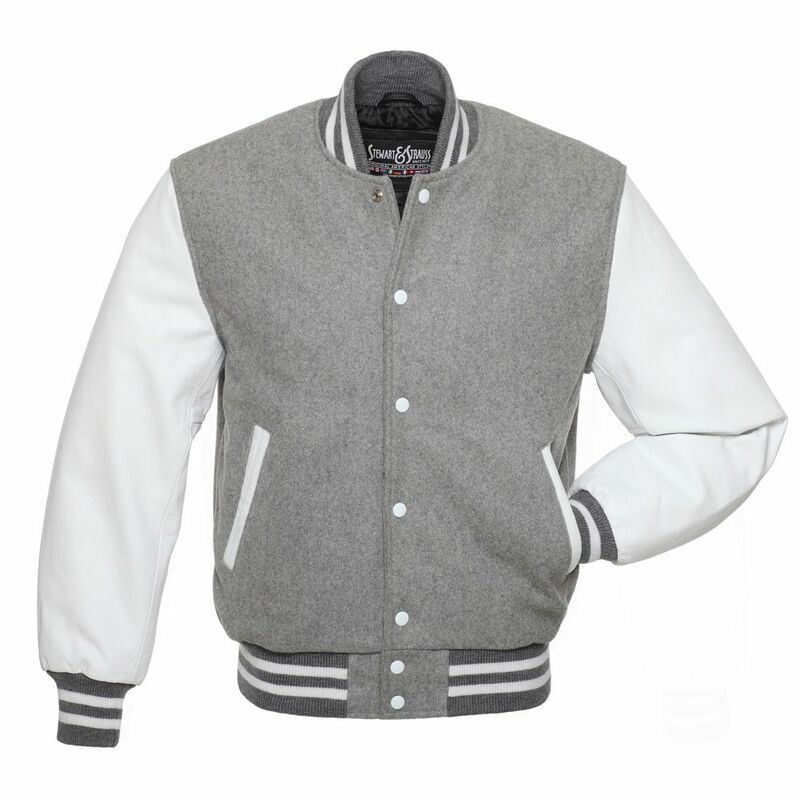 At one time the letterman jacket was considered to be the ultimate status symbol for high school and college athletes. Fast forward to the present day and the same preppy jacket, once coveted by jocks, has become one of the biggest trends in today’s fashion. Street style trendsetters have been rocking the collegiate trend since we first saw it pop up in the 50's, and it shows no signs of losing steam anytime soon. Be unique and choose your own lettering and patches to make your personal statement. Our letterman jackets can be seen on some of the top male and female athletes and celebrities throughout the world. Our varsity jackets have been featured on television show, in the movies and music videos. They can be seen at major sporting events like baseball, basketball, hockey and the list goes on. Some teams even wear our jackets as uniforms. Let Stewart & Strauss' Jacket Shop custom make your group’s jackets today! We've been making the finest letterman jackets ever since 1977. For over 40 years we've been carefully perfecting the craft of creating the best varsity jackets for schools and universities, not only in the US, but all over the world. Besides schools, we also make jackets for teams, clubs, groups and for awards and incentives for companies. There is no minimum order ... we will make 1 or 1001. So whether you’re an individual or a fortune 500 company ... we’ve got you covered. These are the measurements of your body (not the jacket).. To measure your arm length correctly stand up straight with your arms down at your side and measure from the middle of the back of your neck to where your wrist meets your hand. The sizes that we recommend are only suggestions. We are not responsible if you order an incorrect size. If you are unsure of your size please write to us first. All of our jackets are unisex athletic cut for both male and female. TALL SIZES are 1.5” (4cm) longer in sleeves and body length and XTALL SIZES are 3” (8cm) longer in sleeves and body length. "This is a picture of me at my graduation after receiving my Master's degree taken on December 12, 2014 at the University of Central Florida in Orlando, Florida. It was a very cold day so I'm glad I took my varsity jacket!" "Upon retiring from the Army after 25 years of service I wanted to buy myself something that would commemorate that service - what better than a jacket from the Jacketshop! It's perfect and I receive compliments all the time on it. Thank you for making a great jacket and for having superior customer service." "Thank you so much Stewart Strauss for the fabulous jacket. My inspiration for the jacket colors chosen came from Flora, my light and dark blue 1986 El Camino. Flora is actually a ceramic dashboard bobble I received as an unrelated gift. She fit quite nicely on the ledge above the radio and rides along with me quite rhythmically to the engine purr. So for the jacket I chose the same color scheme thinking I’d now have something to wear at weekend cruise-ins. To spruce it up I found some thematic patches to tie the jacket to the car/truck. It took a little while, but with the help of my seamstress mother I was able to get everything attached. The non-vehicle related patches represent my wife and kids and their interests. While the end result isn’t for everyone I like it and will enjoy it come the fall cruising season."